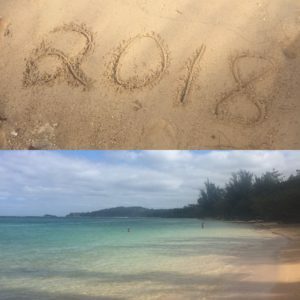 I rang in the new year on the island of Kauai. On New Year’s Eve I stumbled upon this beach, etched the new year in sand and inhaled the warm Hawaiian air. Later that night I took an amazing writing workshop with the brilliant Ann Randolph, with whom I stayed. How lucky to have friends who live in paradise! We rang in 2018 in Hanalei Bay at the Tahiti Nui “disco”. When the live band asked for final 2017 requests someone shouted out, without irony, “Lola!” Huh? None of it — the daily rainbows, acai bowls, the hikes, walks, laughs, chickens, people-watching, vision-boarding, improv exercises, yoga classes, lomi lomi massage — went unappreciated. I hope your new year is as beautiful as this beach on Kauai.